the countdown is now on. just under 100 days until LIGHTS ON!!! 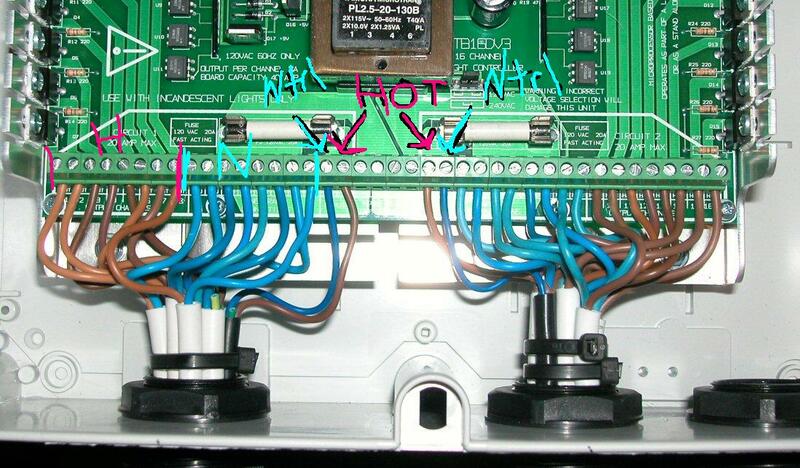 today i ran a new power cable from the meter box to my garage so i could have the LOR componentry on its own switch. 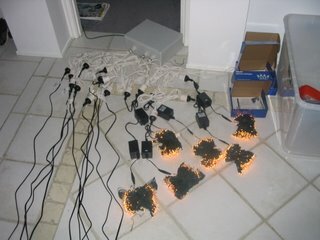 im also going to add an external power point as one of the units will be placed outside so i can cut down on power cabling to the other side of the house. the electrician will be along this week to hook it up. just conducted my 1st full test of the 1st lor unit that i constructed. everything appears to function properly!!! 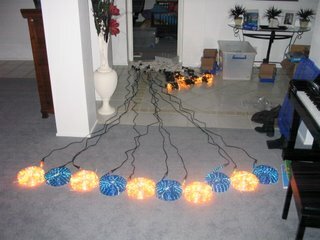 attached are photos of the lights. in no order just for testing purposes. you can also see the lor unit sitting on the ground above the fairy lights. hohohohohoho the push is now on the get things going!! catch you all in the next post. during the last hours of the lightorama sale i was checking over their products again!!!! couldnt help myself so i purchased another CT16D with heat sink on delayed purchase. now i will have to resequence my songs again to suit 48 channels!!!!!!! maybe i will include the neighbours lights in the last 16 channels . Daves cable must have been slightly smaller as i could not fit 8 cables in each. this year at greenpoint (gosford) the lights are going from basic blinking,flashing etc to WOW FACTOR. Whilst christmas lights in this country are good the guys at Light-o-rama in the U.S.A have now given us the ablilty to go to the next level!!!!!! For xmas 2005 i had the usual lights all over the house & as i live in a small st with a cauldersack at the end, we had a few lookers . I have purchased 2 x LOR boards & 1 is good to go with the other one to be completed hopefully this week. mind you i only have a 15m frontage so 32 sets will be radiant. The neighbours know i am up to something ( some have a good idea), so ive gone into "blackops" mode until the time comes to set it up & get it cranking. Some of my family have seen the Carson video & have let on to their friends what is going on, so some of them are already asking when will it be up & will i have a "switching on party" to which i thought that was a good idea so i will have a party on the 1 december 2006. So as i go through the rest of the year i will post items to keep you informed. 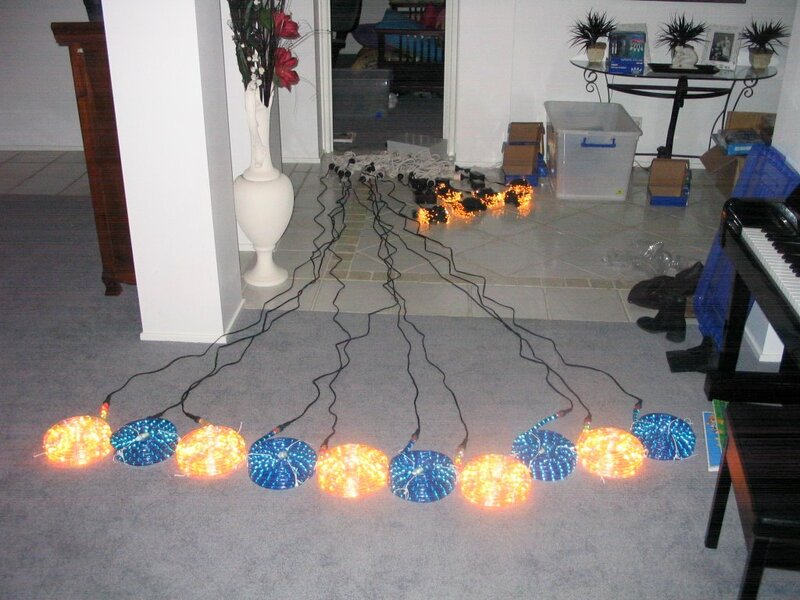 geoffs family house is located at green point gosford & this year we will be taking xmas lights to the next level!!! We will be adding computer animation syncronized with music.